Cross-site request forgery [CSRF], also known as “one-click attack” or session riding or Sea-Surf and abbreviated as CSRF or XSRF, is a type of malicious attack exploit of a website (“Web Application”); where unauthorized commands are transmitted from a user that the website trusts. The impact of a successful CSRF attack is limited to the capabilities exposed by the vulnerable application and based on the privileges of each victim. When targeting a normal user, a successful CSRF attack can compromise end-user data and their associated functions with the web app. If the targeted end user is an Administrator Account (“Admin“); a CSRF attack can compromise the entire WEB Application. Sites that are more likely to be attacked by CSRF are Community websites: Social Networking Sites, Email Providers, and Forums. Or sites that have high accounts associated with them such as Banks and Stocks. CSRF attacks include a malicious exploit of a website in which a user will transmit malicious requests that the target website trusts without the user’s consent. In Cross Site Scripting (“XSS”); the attacker exploits the trust a user has for a website, with CSRF on the other hand, the attacker exploits the trust a website has on a user’s browser. Basically, an attacker will use CSRF to trick a victim into accessing a website or clicking a URL link that contains malicious or unauthorized requests (“Using here some of the Greatest Social Engineering tips/tricks”). 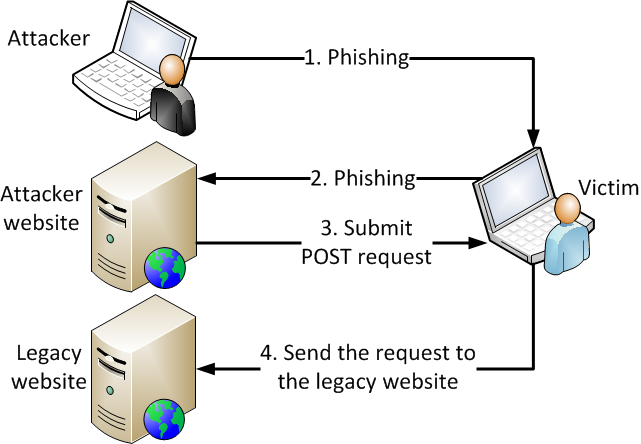 Upon a request against most websites, browsers will include along any credentials related to the particular website, such as the Session Cookie of the user, basic authentication credentials, the IP address of the user… thus, if a user’s authentication session is still valid, an attacker can use CSRF to launch any desired requests against the website, without the website being able to distinguish whether the requests are legitimate or not. A really clear explanation of CSRF. I like that you clarified some of the jargon that is often thrown about without thought for the novice who may not have come across it before. Thanks for a good article.